First deployed in 1998, iSCSI is still extensively used in virtualized environments. However, such a legacy protocol cannot keep up the pace with the modern IT: being designed for 1- and 2-core CPUs, it cannot unleash the full potential of modern processors. For admins looking for maximising their applications’ performance and server CPU utilization, our solution is StarWind iSCSI Accelerator – a free lightweight tool that automatically balances virtualized workloads between all the available server CPU cores. iSCSI is a legacy technology introduced 20 years ago. It was developed to meet the needs of IT at that time. What’s wrong with that good old tech now? For IT, 20 years is far too long. Computer science develops so vigorously that such a long period of time for IT is like a century for the aircraft industry! Don’t get us wrong, we are not debating the importance of iSCSI in this paper. This protocol is still used everywhere, so, like it or not, this technology is here to stay for a while. The problem is that Microsoft iSCSI Initiator doesn’t keep up with server compute power growth. iSCSI was designed when there were maximum 2 physical cores per CPU, so it can balance workloads only between 2 cores. Figure 1 – Microsoft iSCSI Initiator cannot distribute virtualized workloads. Modern servers have 2 CPU sockets that have multiple physical cores. Each physical core, in turn, can be split into 2 logical ones, something that iSCSI Initiator doesn’t get! Every time an iSCSI session starts, it still gets assigned to one of 2 cores. Such load distribution leads to situations when you have a one or 2 cores overwhelmed while others are idle. All this being said, the traditional iSCSI implementation in Hyper-V environments limits the overall infrastructure performance given that your VMs utilize only 2 cores. As a result, you are forced to buy new hardware every time your applications need some more IOPS. For SMBs, it isn’t a smart investment. 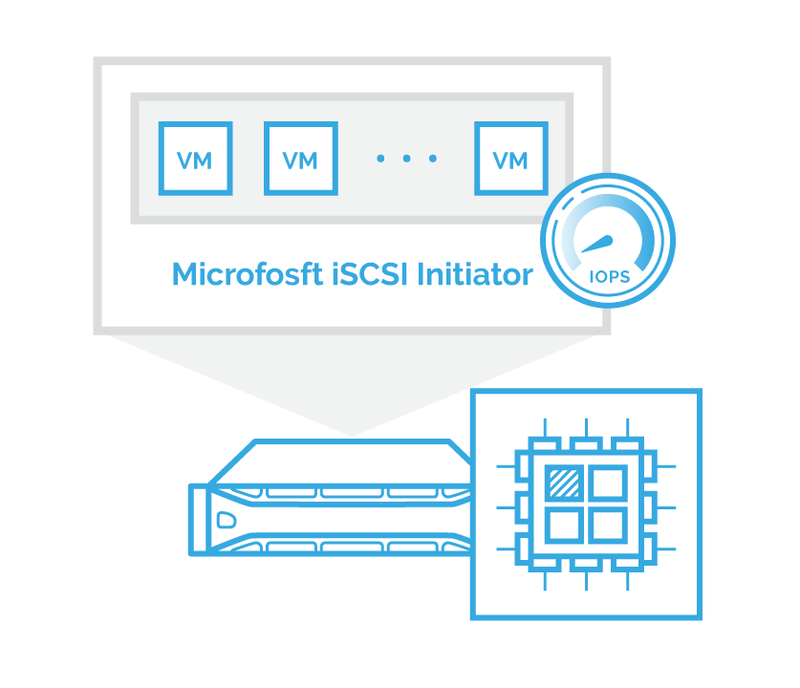 So, admins often need to fine-tune Microsoft iSCSI Initiator such that VMs get enough IOPS. And, it is a rather annoying task. So, having a load balancer may save you both hassle and money. StarWind iSCSI Accelerator is a free tool for balancing virtualized workloads between all CPU cores in Hyper-V servers. The Accelerator is implemented as a filter driver between Microsoft iSCSI Initiator and the hardware presented over the network. Every time a new TCP session is created, it is assigned to a free CPU core. Distributing workloads in such way the solution ensures smart compute resource utilization: no cores overwhelmed while others are idle. Figure 2 – StarWind iSCSI Accelerator in action. Balancing virtualized workloads between all CPU cores. Unlike hardware accelerators, the solution on offer can be installed on any Windows server, without any additional proprietary equipment. 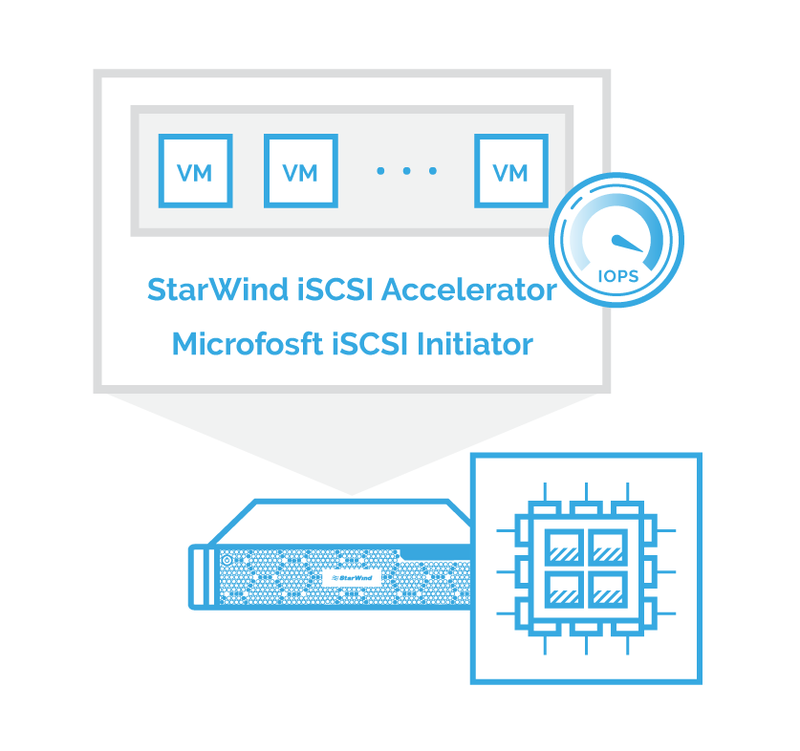 Finally, StarWind iSCSI Accelerator is pretty intuitive and simple to use. Of course, you can keep fine-tuning Microsoft iSCSI Initiator, but it is a tedious process very few have time for. StarWind iSCSI Accelerator, however, is a “plug-and-play” solution: it is good to go from the moment it’s deployed. StarWind iSCSI Accelerator is a free solution for balancing virtualized workloads between CPU cores in your servers. This lightweight tool maximizes utilization of compute resource of your hardware, providing your VMs with the IOPS they need.